Being on-the-go traveling all the time can take it’s toll on your body and staying healthy while traveling is always at the top of my mind. I certainly feel completely wiped out after a trip. You know how the saying goes, “you need a vacation after your vacation.” Changing time zones, not getting enough rest, and indulging in rich foods can leave you feeling run down. 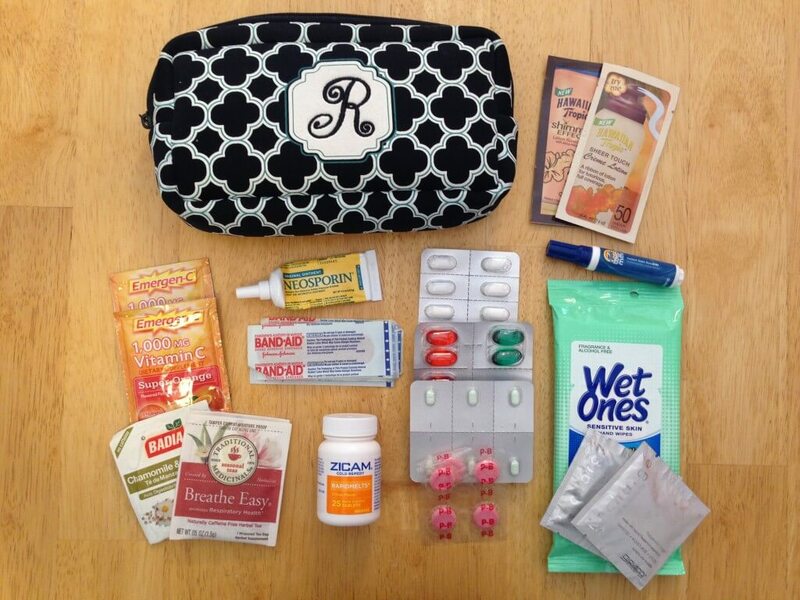 Here are some of the ways I stay healthy while traveling. This is a frequent travelers secret that’s been made a big deal of in media lately. The fact is, antibacterial gels take up precious “liquids” space in your quart sized carry on ziplock bag. Plus, a squirt of gel is just not the same having a moistened cloth to wipe down with. You can use them to wash your hands, wipe down your armrests and tray table on a flight, and they’re useful for a quick refreshment while touring in warm climates. I even use mine to wipe down the outside of my bags when I get home. Call me a germaphobe, but they clean up a bag pretty well! There are two that I use, one is Giovanni Organic Mixed Towelettes with essential oils that are great for your face and body. The other is just the classic Wet Ones Antibacterial Travel Wipes that I buy in bulk travel-sized containers. This is my secret tip for anyone trying to combat jet lag as it’s saved me more times than I can count while traveling. There are tons of benefits to Vitamin B complex, the biggest of which that it wakes me up without the crash of sugar or caffeine. Vitamin B is the key ingredient to most major energy drinks, but taking a bottle full of these with you while traveling is a lot more practical than trying to get liquids through security. Plus, taking it in pill form leaves out the added sugar. Be forewarned though, you will pee neon fluorescent yellow. Unless it’s homemade and freshly baked straight out of the oven (see my next tip for why), then skip it. I personally have a hard time with this one. But it works. Bread is just extra calories and a filler. Save your appetite for your meal. It’s hard to say no to all the tempting and delicious meals offered when traveling. Especially when it’s three courses of local awesomeness all paired with wine. As they say, “When in Rome …” However, if you travel frequently either for business or pleasure, you have to create your own “normal” to keep your waistline in check. Skip the boring foods and don’t go crazy at breakfast buffets. But when that homemade one-of-a-kind only-made-here cake comes around — go for it. In addition, I have a “Three Bites” rule when it comes to dessert. Typically, the first bite of anything tastes the best. The second bite confirms your oral euphoria. But then the pow of flavor starts to fade. That’s when you stop. Savor those first three bites. This is another great jet lag fighter. Often, when leaping into a full schedule after changing time zones, it’s easy to get run down, tired, and irritable. Your immune system is vulnerable. So, on your first day visiting a new city, don’t take a nap. Stay awake until your normal bedtime in this new time zone and then get a full 7 to 8 hours of sleep. Skip the temptation to go out for drinks or see just one more thing. Getting a good night’s rest will help you reset your internal clock, get on your current location’s time zone, and set the bar for the rest of your trip. Even if you take all the precautions above, you still might wake up one morning with a scratchy throat and the first signs of a head cold. Be prepared. 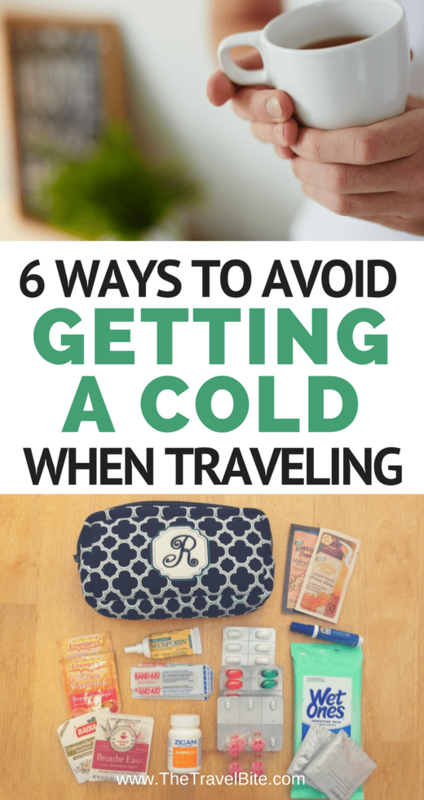 Pack your own medicine kit with cold and flu meds, allergy meds, ibuprofen, throat lozenges, and some chamomile tea for good measure. I also swear by Zicam tablets for zinc as it nips it in the bud before a cold has a chance to take hold. It’s better to pack these and have them on hand just in case than it is to try and locate a pharmacy if you feel run down. Do you have any good tips to add? Comment below and let us know. Disclosure: There are affiliate links within this article, however, I would not recommend anything I don’t personally buy and use. Tried it with Krispy Kreme donuts my son brought home yesterday – 3 bites and put the rest down. Worked like a charm – thanks! I completely relate to feeling the pressure of trying to get the right balance between eating local delicacies and not over-indulging and putting on weight while travelling. I find myself having a local specialty cake every day because I am a bit of a cake fan but am trying to get better about being more self disciplined on my travels with things like the breakfast buffet, and, as you say, especially with the free bread! Such a big culprit! I always pack running gear too, sometimes there’s something I’d rather go do, but running in a new place is an amazing way to see it, finding hidden gems and beautiful lookouts! These are great tips! I will have to look into the Vitamin B but all others I practice religiously. Well, maybe not quite religious on that 3 bite rule but I do agree on skipping on the filler and indulging on the good stuff you can only get there! Exercise is also a big key for me to stay healthy so I use an app called Lolo to get in 7-20 minutes of exercises I can do in my hotel room or anywhere. Thanks Rachelle for sharing your tips! Vitamin B is going to change your life! Once you try it, you won’t forget it. It’s such a natural energy boost. Awesome tips! All so important to keep in mind.! I used to have such an easy time packing healthy snacks for trips… the past couple of times I’ve succumbed to the not quite as healthy and feeling crappy as a result. It pays to do the extra prep for feeling great in return. The one thing your missing from your bag of tricks…you must add honey to that bag it is the preventive that counts.. when traveling.. a few tablespoons of honey a day or two prior to leaving from your city builds up your defenses. . Once you land in a new city or another country seek out and buy fresh local honey infect your body with new local refined bacteria and your body will counter it.. I have traveled to many areas and have never been sick whether in winter, spring, summer or fall.. Honey and Coconut is the answer fresh honey, coconut water /coconut meat is also on top of my list of daily intake prior and during any trip.. Combine the two and you will not wake up or go to bed with a cold.